The shouting has largely subsided. The Court's ruling has settled in, and the outward manifestations of euphoria and despair have largely moved on to other issues. Despite what has been said--both leading up to the decision and immediately thereafter--it was neither one of the very best or very worst decisions in recent memory. Not even among this past term's collection of 5-4 rulings. As the world knows, the Supreme Court upheld the 3rd version of President Trump's so-called "travel ban." After several courts had invalidated the first and second versions, a third one was drafted. This executive order--Proclamation No. 9645 (as later amended by Proclamation No. 9723)--suspended the entry into this country of nationals from seven foreign nations. Five of the seven mostly-Muslim countries from the original executive order remained on the list; North Korea and Venezuela were then added. In a 5-4 decision, the Court ruled that the Proclamation was within the "extraordinary" authority given to the President under the Immigration an Nationality Act, specifically, §1182(f). A “total and complete shutdown of Muslims entering the United States” is needed. The United States is “having problems with Muslims coming into the country." 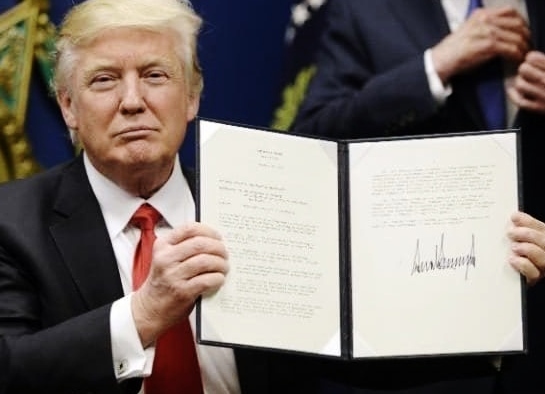 The first executive order was a needed “Muslim ban." The second executive order, regrettably, is “watered down." A "total and complete shutdown of Muslims entering the United States" is needed. "There is great hatred towards Americans by large segments of the Muslim population." "They believe that "violence against Americans here in the United States is justified as a part of the global jihad." "Shariah authorizes such atrocities as murder against nonbelievers who won’t convert, beheadings and more unthinkable acts." "It is obvious to anybody the hatred is beyond comprehension." "Our country cannot be the victims of the horrendous attacks by people that believe only in Jihad." Of course, both the Chief Justice and Justice Sotomayor were quoting Donald Trump, while he was a candidate and after his election. Also, of course, neither one of them were endorsing a single word. But then, what to make of those words and the sentiments that they expressed when assessing the legal validity of the travel ban? For all 4 dissenting Justices, the travel ban was based on little more than Donald Trump's clearly manifested bigotry against Muslims. The President's hostility toward a religion violated fundamental American constitutional traditions and principles and, as such, rendered the resulting travel ban invalid under the 1st Amendment. That was one side of the controversy. The one-vote short-of-winning side. The 5-vote winning side emphasized that the power vested in the office of the President with regard to immigration and other travel into this country is "extraordinary." First, however, Chief Justice Roberts dealt with Donald Trump's anti-Muslim outbursts and other fits of fury. He didn't try to ignore them, and he left no doubt that he found them shameful. Yet it cannot be denied that the Federal Government and the Presidents who have carried its laws into effect have—from the Nation’s earliest days—performed unevenly in living up to those inspiring words. But the issue before us is not whether to denounce [Trump's] statements. We must consider not only the statements of a particular President [as in the current one], but also the authority of the Presidency itself. Based on the evidence in the record [i.e., Donald Trump's language and behavior outlined by both the majority and dissent], a reasonable observer would conclude that the Proclamation was motivated by anti-Muslim animus. That alone suffices to show that plaintiffs are likely to succeed on the merits of their Establishment Clause claim. So, the extremely broad power given to the office of the President, by the Constitution and by legislation, versus the unanimously acknowledged recurrent manifestations of religious bigotry by a particular president. That was the question. It was a close one. And one vote made the difference. Now, for one final observation. What about that 1-vote difference? That 5-4 vote? All 5 Republicans on one side. All 4 Democrats on the other. Come on! What are the mathematical odds that such a partisan split in the vote could result if this case were actually considered in a neutral, detached, non-biased, non-partisan manner by each of the nine Justices? To pose the question is to answer it. Not a single Republican Justice saw merit in the Democratic Justices' position? And vice-versa? Regardless of one's personal view of this case, it seems impossible to deny that the outcome in this case was the result of partisanship more than any independent, impartial judicial review. Ugh!--again for this current Court. Okay, allow me one additional "final" observation. In her dissenting opinion, Justice Sotomayor compared the Court's decision to Korematsu v. United States (1944), where the Court had upheld the internment of Japanese-Americans during World War II. Naturally, Chief Justice Roberts disputed that comparison in his majority opinion.